Think of Blackpool and the gleaming glare of the Illuminattions, the whizz of a passing rollercoaster and the scent of frying fish and chips or sweet sugared donuts fill your head. But, like any hit record, there’s a B-side to Blackpool, and a new campaign launches today aiming to bring the town’s architecture and heritage to the fore. More than 18m people visited the resort in 2016, with tourism worth £1.44bn to the local economy. It hopes to send out a ‘positive and confident message about everyday culture in Blackpool from opera to knitting, carnivals to light art, from the architecture to fish and chips’. Blackpool born and bred punk musician and music journalist John Robb will front today’s launch event ‘A Conversation about Culture’ at Blackpool Tower Circus, with a panel of experts made up of Professor Vanessa Toulmin, director of city and cultural engagement at the University of Sheffield; LeftCoast founding director Michael Trainor; Grand Theatre chief executive Ruth Eastwood and special guest Tony Walsh, a poet and writer. 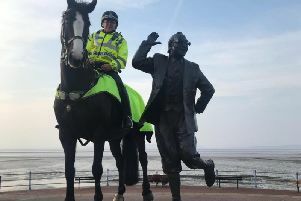 Mr Robb said: “Blackpool is a creative town with a thriving culture and now that I am an ambassador, I can portray ‘my’ Blackpool and highlight the DNA that underpins the town’s glory and glamour. Joining forces for the campaign are cultural venues the Grand Theatre, the Winter Gardens and the Grundy Art Gallery, with organisations VisitBlackpool, Blackpool Arts Service and LeftCoast. Local stars of the culture industries will also reveal their own thoughts on Blackpool’s B-side and what the resort means to them - including internationally renowned singer Alfie Boe and pop star Little Boots. Michael Trainor, former artistic director at LeftCoast, said: “People are drawn to Blackpool for multiple reasons; from the more obvious appeals of the fun of the fair, the seaside, and the hi-tech adrenalin rides, to the specialist attractions of its unique popular culture. “Seeing hundreds of lit-up Harley Davidsons cruising the Promenade during the Illuminations, or the streets filled with the peacock glamour of the ballroom championships hosted in the town, are enlivening experiences. “For me Blackpool puts the ‘cult’ in culture. It has excelled at being uniquely itself since 1879 when the first Illuminations were described as ‘artificial sunshine’. Among Blackpool’s cultural highlights are the Tower Circus, one of the only surviving Victorian circus arenas in use still today. LeftCoast, one of the Arts Council’s Creative People and Places Projects, has brought renowned acts such as Circa and dreamthinkspeak to town - hailed as the kind of show usually seen at international festivals. And future projects to be promoted under the CultureBlackpool banner will be the £16m ‘Amuseum’, within the new Sands Venue hotel on the Promenade, telling the story of the city’s contribution to the UK’s popular culture, as well as the £250m conference centre at the Winter Gardens.